Sit back and enjoy a cup of joe or a bowl of chowder in our beautiful hand thrown pottery Cappuccino mug or soup mug. Carefully designed to fit your hand and glazed in our beautiful satin Turquoise glaze on the out side and glossy white liner glaze makes these visually stunning. Each of our cozy cappuccino mugs or soup bowls with handles are hand thrown on the pottery wheel from a durable stoneware clay. Each cappuccino cup or soup mug measures approx. 3" H x 5" W and holds 20oz each. Nothing is quite like waking up to a cozy cup of Joe. 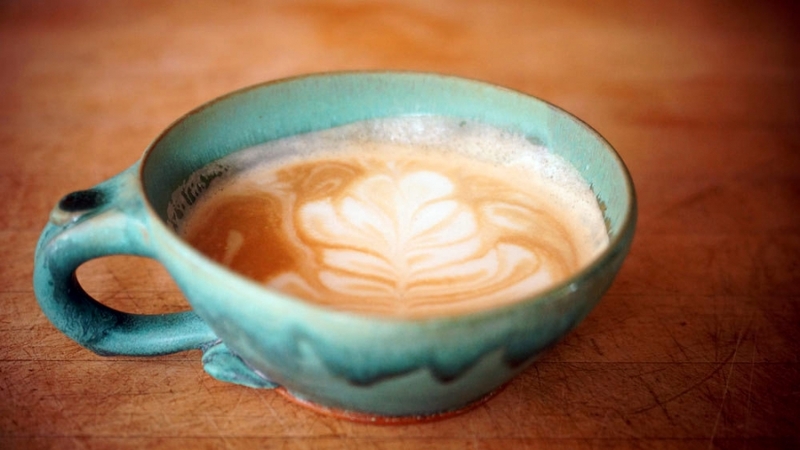 Our handmade pottery coffee/cappuccino cups can enrich that experience. From the wheel to the fire, much love and care went into producing each cup. All of our stoneware pottery is fully functional for daily use, is food safe, as well as dishwasher and microwave safe. Everything in our shop has been handmade by husband and wife potters Kristen and JR Page in Burnsville North Carolina.